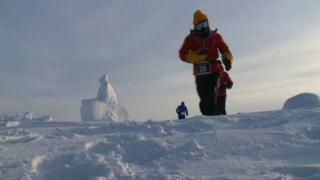 The world's hardest, and coldest, marathon has taken place at Russia's Barneo ice station at the geographic North Pole. The 26.2-mile (42.2km) race, in temperatures as low as -30C (-22F), tempted 47 competitors from 20 countries to pit themselves against the elements. American Mike Wardian was first home in four hours, seven minutes and 40 seconds. Germany's Anne-Marie Flammersfeld won the women's event in a time of 4:52.45.